DIMENSIONS - 5.2cm x 2.6cm x 10.2cm / 20.5" x 1.02" x 4.02"
If you use 2 amps, mains powered effects, or need to drive long cables, the HumDinger is essential. The Humdinger was designed to eliminate earth loops in audio equipment by isolating the second output with a high quality audio transformer.
" The Main output is buffered using our custom designed 1:1 class A buffer design guaranteed not to mess with your tone.
" The Isolated output uses a high quality audio transformer to the best signal possible.
" The isolated output also features a PHASE switch, so you can get rid of any phase problems between two amplifiers.
" Both outputs will drive long lengths of cable so you don't need to worry about the distance between your pedal board and your amp.
" It's impossibly small and will fit on even the smallest of pedal boards. Earth loops are a common complaint. As soon as the ground on your gear has more than one main route to earth, you have the potential for an earth loop. The best and safest way to get rid of an earth loop is to isolate the ground that is causing the hum. Using the HumDinger to get rid of earth loops is easy. If you use 2 amps all you need to do is stick the HumDinger at the end of your effects chain. Your main (buffered) output goes to one amp, and the isolated output goes to the other. Your earth is consistent through the main output but isolated through the isolated output. 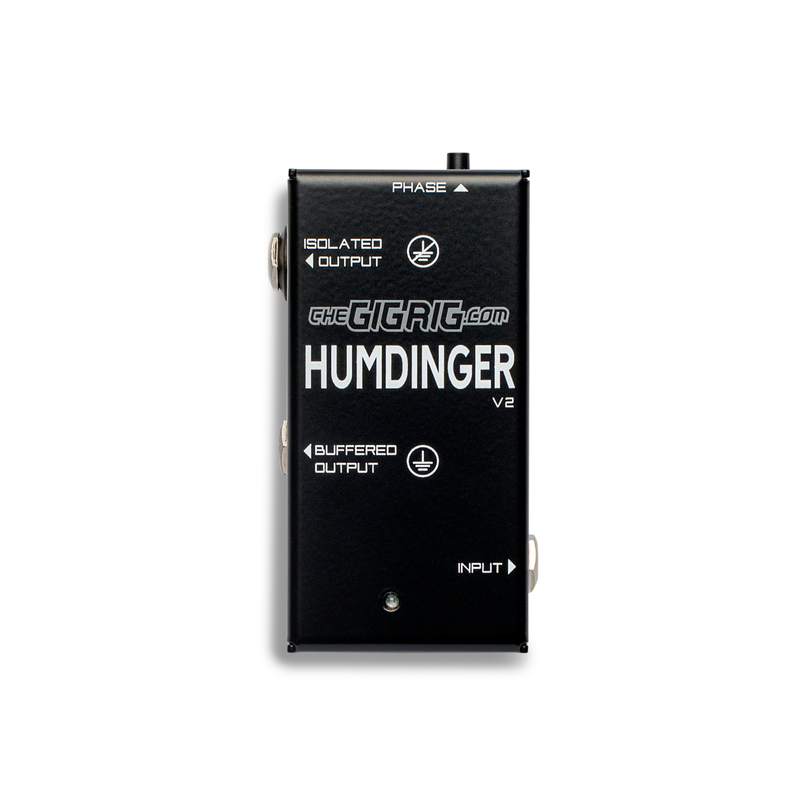 Using a mains powered effects pedal, simply place the HumDinger in the chain after the mains powered effect. The Mains powered effect is your main ground and the ground from the amp is isolated. How do I use 2 amps with the HumDinger? It couldn't be easier to use a two amp rig with the HumDinger. Simpply plug the HumDinger in as the last pedal in your chain then plug the two outputs from the HumDinger into your two amps. Use the PHASE switch to correct the phase between the two amps. (set them at the same level then toggle the phase switch. 'IN PHASE' will have more bottom end. How do I use the HumDinger with a stereo setup? Stereo setups are wonderful for createing huge soundscapes, but earth loops are very common. Never fear, the HumDinger can sort these out in a second. Simpply place the HumDinger between the B OUTPUT of the stereo pedal. In this situation all you need to do is hook up to the ISOLATED output from the HUmDinger as the earth is being supplied by OUTPUT A from the stereo pedal. Here is a quick demo that will give you but a glimpse of the potential of TheGigRig HumDinger.